1. 355-ft Self Supporting Broadcast Tower located on the rooftop of a building in a business district of Savannah, Georgia. Existing paint was old and in very poor condition. 2. Tower rigging and equipment placement was very limited and required coordination with the city and local business owners. 3. Painting preparation required all removed paint chips and debris be collected and disposed of each day. Parking lots, buildings, and city sidewalks could not be compromised during the project. 4. During the tower priming and painting process, extreme care of the surroundings, including covering numerous parked cars near the tower, had to be exercised. The Shane Davis Tower Painting team resolved numerous challengs that confronted the crew, and completed the project ahead of schedule. The project was also completed to the utter satisfaction of the tower owner. TCI would liketo thank Shane Davis Tower Painting Inc. for doing a remarkable job on this challenging project. We had been planning for some time to paint the tower at our studio site. What once was a sparsely populated area is now surrounded by retail space. Liability is a concern that led to some very high job bids. 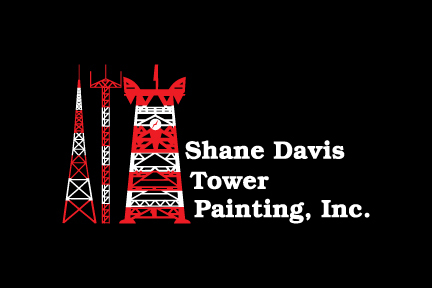 We were very pleased to receive a favorable estimate from Shane Davis Tower Painters. We were very pleased also, with every step of the process, from scheduling the job to supplying insurance certificates to the care and efficiency with the way they did the work. The home office kept us informed throughout. The crew was courteous, professional and maintained excellent communications. The painting came in on time, on budget and actually led to us having two other towers and some other structures painted while the crew was here. We were that pleased with the work of Shane Davis. As far as the painting went, the towers were properly prepared and properly painted by a crew with obvious experience and knowledge. Downtime to radio station tenants on the towers was kept to a minimum. The worksite was clean and they took care to cover employees’ vehicles when the wind threatened to move overspray around. The crew on the ground made sure that there were no problems. I mentioned that our studio tower was surrounded by stores and vehicles. As far as I know there were no claims made for any kind of damage. Certainly nothing came from station personnel. I would recommend Shane Davis Tower Painters without hesitation or reservation to anyone looking for top quality work at a favorable price. Just a quick note to mention how great our experience at WCSC-TV in Charleston, South Carolina was with you and your crew. As you are well aware, there are a lot of moving parts to painting a 2000’ foot tall tower. You and your crew were not only great painters, but excellent communicators which is equally important in my mind since we have multiple TV, FM and cellular tenants on the structure to coordinate with. When I put this project out for bid, not only were you the low bidder on the job, when I called all other companies to let them know who they lost out to, everyone one of them said I had hired the best in the business. I would think that is pretty high praise, especially coming from your peers. You folks did a quality job for a fair price and in this day and age, I’m not sure I could ask for a lot more. Thanks and I look forward to working with you again some day.